connections between the spiritual world (vertical) and the physical, everyday world (horizontal). Unlike the traditional Tarot, the Vertical Oracle bases its images and meanings upon a very contemporary set of interpretations. This makes the deck of 52 cards very useful for those who find themselves on a continuous quest for the new and unusual. Alli’s and Pickering’s creation has no shortage of those. I would however not recommend this deck for the Tarot beginner who wishes to learn specifically about the Tarot and its interpretations and use. The use of such a wildly different deck may lead to confusion. On the other hand, the deck is not only of use for the experienced Tarot reader. As suggested above, a person with a particularly creative mind, in search of something new, will find many benefits from this deck. The most notable thing about the deck is the fact that the cards are not numbered. Instead, each card has only a word or phrase that accompanies the image. Another difference from the Tarot is that the lettering of the words differ from card to card in both color and style. Some are in gothic script, others in italics; some are red, white, or black, and so on. These different styles subtly coincide with the meaning and style of the card images. The images are constructed of photos, giving them a sense of reality. While images are realistic, they are put together in such a way to also be forcefully mystical. Hence, there is a strong connection between the “vertical” or spiritual, and the “horizontal” or physical reality. They therefore create for the reader a link between the two worlds in order to arrive at a useful conclusion. The combination of realism and the magical is therefore very powerful. 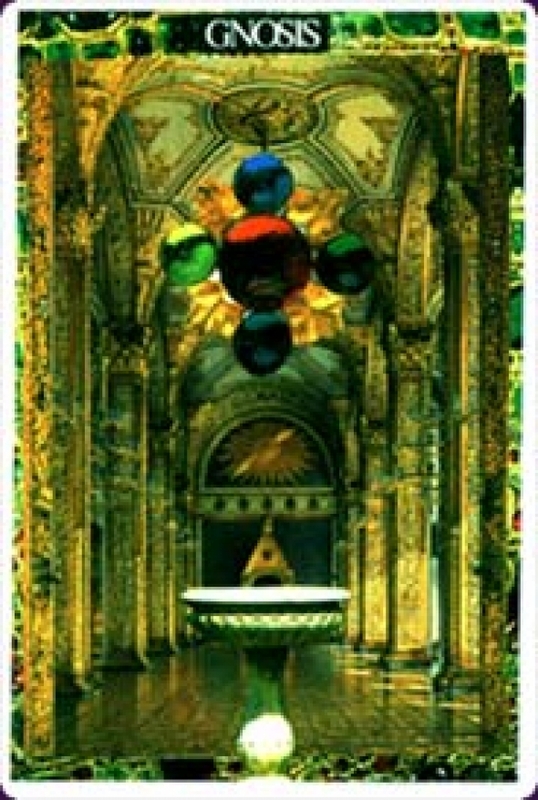 As such, each card has a deeply emotional association: shock, surprise, beauty, peace, vertigo – I could go on and on. In fact, the user of this deck could go through the cards over and over, and each time find something new to shock, surprise or fascinate. To illustrate more specifically, the “Fear” card shows a hand in a claw like, grabbing motion, emerging from a wall of flames. “Divine Intervention” includes a hand in an entirely different context: the palm is turned towards the reader, almost as if to indicate that help is available for the asking. My favorites are “Possibilities” and “Power Source”. The former displays four large diamonds dropping over a tower structure, while the latter is a woman with a light in the center of her forehead against the background of a cornfield, indicating that power and prosperity lies within the self. In my experience, reading these cards tend to be a brutally honest experience. They therefore work best for me when I’m trying to figure out a personal issue where I tend to hide the truth from myself. On the other hand, readings can also result in surprisingly positive outcomes and encouragement. This is a nice balance to the brutality, and also provides a sense of truth to all readings, whether positive or negative – I know the cards will not “lie” to me. I find that the Vertical Oracle specifically resonates with me for a number of reasons. Firstly, I have several years of experience with various Tarot decks, and the Oracle is a refreshing change from what I’m used to. Secondly, I have read Mr. Alli’s work and enjoy his views and philosophies. Hence the Oracle’s style is not new to me, but rather a reinforcement of what I’ve already studied. And finally, I never tire of Ms. Pickering’s images or their effect on me.